The Go Pure 5-Stage Water Purifier's filtration process uses 5 different filters to remove organics, turbidity, chlorine, odour, bacteria and other harmful substances. Now that’s a thorough cleaning! Not only does the Go Pure Water Purifier remove impurities in your water supply, but it also adds essential minerals that it needs. Even after water has been treated by your local municipality, it can still pick up harmful contaminants such as rust from the pipes in your home. So make the smart choice and let the Go Pure Advanced 5-Stage Filtration Process give your family the water quality they deserve. 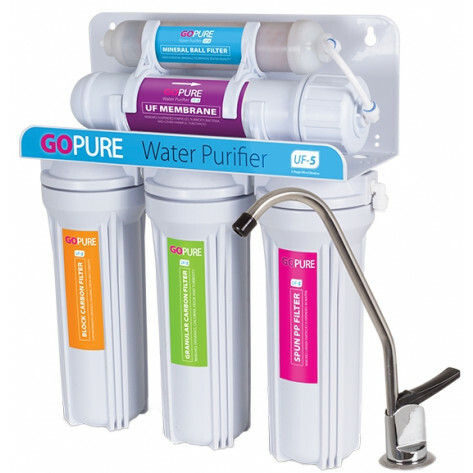 Installing the Go Pure Water Purifier is so easy that you can do it yourself in 3 simple steps. Just follow the steps on the packaging and voilà! There you have it! Cleaner, healthier water right from the tap in your own home. 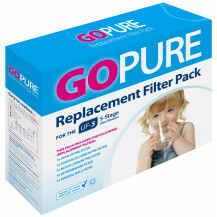 Once installed, the Go Pure water filtration system purifies over 6000 litres in a 12 month period. It is also over 300 times cheaper than bottled water.